August | 2009 | Move Your "..BUT God .."
The photo is the front door of the little house with the screen door out back; these front steps are filled with love. Love that keeps on coming. Love that gets slapped down and gets up again to keep loving. Love that refuses to quit. My real question should be why Jesus had to die to prove God’s love for us. Yes, I know Jesus’ blood atones for us. But God isn’t bloodthirsty., so why did it require that? I wonder – is it in part because our sixth love language (beyond affirming words, loving touch, giving gifts, acts of service, and quality time) , the bottom line we humans all understand, the one we all hold out for and perhaps even demand as proof of love, is blood: sacrificing your own life for mine? That we understand – maybe, until some circumstance or event that doesn’t go according to our plans causes us to question God’s heart. I’m not condemning you, my readers; I’ve done that myself, and I know it comes out of pain and confusion. Even after Jesus shed his own blood and God sacrificed his beloved Son, we don’t believe God loves us! Is it that perhaps some stubborn, self-preserving pride drives us to deny such love? “No, my circumstances tell me . . . . ” “But I don’t feel your love, God . . . .” Perversely somehow we’d rather think we’re right that God doesn’t love us than come to him in humbled recognition that there’s no reason on earth that God should love us – no reason besides WHO GOD IS himself: completely LOVE! I can hardly read the computer screen through the tears flooding from my recognition of the extravagant, unjustified, unrelenting love of God. My tears come, too, from the knowledge that I had to endure betrayal – and that I had to recognize the lies I had held onto, also, that kept me from loving unrelentingly – to finally get it in my gut that God IS love, nothing but love, purely and unceasingly love. This conforming business hurts – but rather than resent God for the pain, I see and now hunger to press in to the truth that Jesus bore, and bears joyfully, even deeper pain to love me. In the scariest valley of my life, I am rejoicing and reveling like a glutton in the passionate, unrelenting love God has for me – so I can get up and love again, and again, and again. Why won’t you come through the screen door into arms waiting to embrace you? What circumstances in your life are big enough to outweigh the relentless, extravagant love of God in Jesus? What are you holding out for? Why won’t you love with his love? Who won’t you love with his love? A “ . . . but . . . “ to pray: God, ABBA Father, Daddy, maybe not in my mind, but in my heart I have denied your love for me over and over again, BUT who are you, what kind of love can this be that loves in the face of pain, again and again and again? I want that love for me and in me. Maybe I’m still too scared to truly want it through me, BUT because you love me, I am willing to love this one who keeps denying and rejecting my love. Hold my hand and hold my heart as I keep loving, and please give me joy along the way so I can persist and pursue and bear your likeness in me. Your own “. . . but . . .” to pay: Father God, Jesus, lover of my soul, I have denied your love for me because _________________________________ BUT I lay that down in the face of your relentless love, and I say to you now _____________________. I’ve been hurt so badly that I don’t want to keep loving ________________, BUT ___________________. 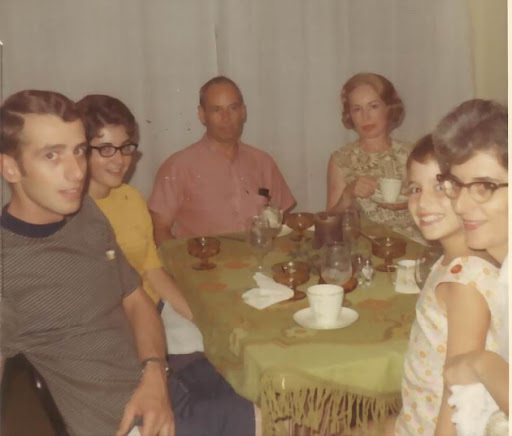 Oooh, bad family photo of us all from about 1968, with my Dad and his sister Francine in center. You may have noticed my posts are distinctly lacking in the “God is in the flowers and rainbows” flavor. In fact, more of my posts are about trials I face or disappointments in myself. This no doubt comes from the fact that, while I am every bit female, I‘ve never been a “girly” girl. I look like death warmed over in pink, I simply look silly in ruffles, and though I love jewelry, the beautiful blingy cocktail rings my sweet friend Patty has given me are a glaring contradiction on my thin, veiny hands. And frankly, my life has been so challenge-filled since 1995 that I find little comfort in stress-busting devotionals that advise me to take a bubble bath or have my nails done. God IS in the flowers and rainbows, and probably in bubbles, too, but I need a God who is there to be found IN my pain, loss, anxiety, disappointments, grief, and frustrations. If He isn’t to be encountered and experienced there, then what hope do any of us have? After I take the bubble bath and have my nails done, what has changed? Have those admittedly fun exercises changed my circumstances? If they haven’t changed my situation, have they changed me? No. And while I love bubble baths, I need something more substantial in my life. The most effective stress-buster to me is seeing God’s hand moving to transform me in the middle of the messes my life seems to step into again and again like the ubiquitous gum on a summer day in a Wal-Mart parking lot. I long to dance in the rain – not because I’m a pessimist, but because I know rain will come. I need a God who isn’t afraid to get wet, who can transcend, transfigure, translate and transform, as the lyrics in John Mark McMillan’s moving, anointed song, “How He Loves” http://www.youtube.com/watch?v=Chx6s3qXKt4&feature=related powerfully declare: “When all of a sudden, I am unaware of these afflictions eclipsed by glory, and I realize just how beautiful You are and how great your affections are for me.” I need a God of grit and guts and glory. That’s who I’m encountering in this deepest trial of my life – a God of incredible, deep compassion and love – and that’s who I pray you find within these thoughts and discoveries of mine. This post is about my father, but Bill and Susan Miller, this one is for you. I love you! “Uuuuhhhh . . . uuuhh . . . .” Dad’s mouth opened as he tried to speak. His eyes still held that “deer in the headlights” look of incomprehension so typical of Alzheimer’s patients, but I caught a spark of – what – hope? Thanks? Love? Mom, Bonnie and I were gathered around him holding his hand, once so strong and steady as he guided wood through the saw blade, but now so forceless and weak, and touching his now thin shoulders. We’d come to say good-bye. Dad had developed pneumonia and seemed to recover from that, but now he had stopped eating. This Monday morning, the day before Dad’s 75th birthday, a nurse in the Alzheimer’s unit of the nursing home had called my Mom to tell her to come quickly, as this might be Dad’s last day. I’d thrown the car into gear and flown to Mom’s house to pick her up and quickly dash up to the home. “Oh, Rosie!” was all she could get out through her sobbing. The past five years of grieving as we watched Dad steadily decline still hadn’t prepared our hearts for this day. Surprisingly, when Mom and I arrived, Dad actually looked pretty good. He was sitting up in a chair looking apparently healthy and pretty much like he usually did. Mom and I chatted to him while the nurses worked around us. “To him” was all we could do, because Dad hadn’t been able to speak for the past two years; in fact, he hadn’t even uttered so much as a syllable on the many Sundays when my husband, our ten-year-old son and I stopped in to see him after church. Ethan had never really known Grandpa when he was well, this man who made wagons and pedal fire trucks and doll houses and so many treasures for his grandchildren before dementia robbed him of his considerable talents. But he was still Grandpa, still my Dad, and I thought back to treasured evenings in our back yard sitting on his telescope mount as he twirled me around the stars, or standing beside him in the garage redolent with the fragrance of newly sawn pine as he showed me how to drive a nail and drill a hole in a scrap of lumber. He was still the man I loved and respected, somewhere inside there. I dared to believe that, fought to hope it was true. Mom and I stepped aside to let the nurse take Dad’s vitals. The door opened and my sister Bonnie walked into the room. The nurse gave a slight gasp as my Dad’s vital signs shot up. Bonnie hadn’t seen Dad in two years, not since he moved from his home into this skilled nursing facility. She did live quite a distance away, but it was just too painful for her to see Dad in his continually deteriorating condition. I understood completely. Bonnie had always been there for Dad and Mom over the years, and she still helped Mom every way she could. Dad hadn’t seen her in two years, yet something in him rose up in recognition of a face he loved, and rose up so powerfully that his heart rate and respiration increased immediately! Then we said it, every eye awash in tears that flowed to the nurses in the room, too. “Dad, if you’re ready to go, we give you our blessing to go home to Heaven.” That’s when it happened: Dad tried to speak! He looked directly into our faces and said, “Uuuhhh . . . uuuhhhhhh.” Those might have been babbled syllables to anyone else, but to the tree of us, they were the voice of a beloved husband and father, struck dumb by a disease advancing brain cell by brain cell for five years, but the man still alive and vital inside, somewhere, somehow! One by one we bent down and kissed him, hugged him, squeezed his feeble hand, and left, fairly confident that his healthy appearance meant this might be a false alarm. Two days later he died, sweetly and quietly and I believe liberated to leave the prison of his disease and go meet his fellow carpenter. Some people might understandable dismiss this as coincidence to which we attributed too much significance. I might, too, had it not been for a comment from one of the nurses after Dad died, and the same scene repeated exactly four weeks later over the bed of Dad’s sister, my Aunt Cine. Francine developed Alzheimer’s two years before Dad exhibited signs of the disease. She had been bedridden, fallen away to 80 pounds, unable to walk or speak, at death’s door for over a year. Mom and I went to see her on her birthday. We took her some balloons. “Yes,” I concurred without hesitation. Cine was in much worse shape than Dad had been, but the day Dad died, one of the nurses on Dad’s floor at his nursing home had said to me, ‘Your father was such a sweet, wonderful man. We enjoyed him so much.” How had she known that? How can you know that about someone who can’t communicate . . . unless Dad’s spirit had been able to break out of his silence and communicate somehow, quite apart from words? “Uuuhhh . . . . uuuhhhh.” Her face turned up to mine, her wild yet shallow eyes looking directly into mine, and I knew she was there. She saw me. We kissed her and went home. So did Cine, the very next day. I never gave much credence to the notion that sometimes people need permission from their loved ones to leave. I always thought your body had the deciding voice in when you die. Now I’m certain that is not always the case. Two intelligent, resourceful, achieving, loving people, struck down by a disease so heinous and hideous that it strikes terror in the hearts of most people. Any way but that one! What could possible be the sliver lining in my father’s and my aunt’s deaths? Simply and profoundly this: no matter what disease does to our bodies or our brains, God’s Spirit never leaves our spirit. We remain, whole, intact, filled with all the life and love we’ve known and given away, whether the outside world can access it or not. And is that a meager comfort in the face of such deep loss and pain? 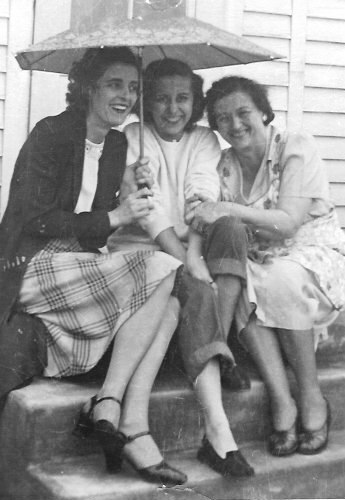 No, even though my sister, brother and I know we live in the shadow of DNA that may spell the same end for us, especially now that our mother has vascular dementia from numerous small strokes. It is somehow a great comfort and source of hope. Yes, I pray researchers will home in quickly on what causes and what can cure and prevent Alzheimer’s, BUT while I wait, I rest in the knowledge that who I truly am, who we truly are, endures above and beyond all else. Count that as an incredible, joyful, overcoming blessing! God, this __________________ seems insurmountable, impossible, impassable, life-threatening, BUT you ______________________________________________. Amen! Some journeys take you to unexpected discoveries in familiar places. Walking through the most difficult time of my life through the smoking ruins of a destroyed relationship, I find Jesus waiting to meet me. . Recently my friend Sharon’s daughter, Charity, told me she wanted to take me on a journey through “the Father’s house,” a spiritual journey into Jesus that had given her a breakthrough in a challenging time in her own life. Hungry to experience God’s presence more deeply, I sat with her in Sharon’s bedroom and lifted my sanctified imagination to the Holy Spirit’s voice. “Please, God, I don’t want to conjure this out of my own imagination,” I silently cried out. Long ago I had sat beside my then boyfriend in a “spiritual” Sunday evening church service, the hair standing up on my arms, my spirit filled with the suspicion that the “spirit guide” the pastor was listening to absolutely was NOT Jesus. I wanted nothing to do with that kind of experience ever again! But I know Sharon’s and Charity’s heart and faith, and my own as well, so this day I could sit in confidence believing that Jesus guarded my thoughts and nothing of the Enemy could enter. So I set off in my mind’s eye up a long driveway. We talked about what we were “seeing,” and my friend described a beautiful mansion in vivid detail. I was having some trouble, my analytical brain questioning whether what I was sensing was me or the Lord, but I pressed on in faith, believing God truly did want to speak something to my heart. Crossing polished hardwood floors, walking into large rooms whose vague details disappeared as I tried to focus on them, I just wasn’t getting anything. The idea is to “walk” through God’s house to find Jesus. My friend’s words were awash in love and amazement as she narrated her journey. Hmmm . . . . No such experience for me. Why was I getting nowhere? After much mental wandering, I decided to follow the tug on my heart to go “out back,” and I pushed open a worn screen door and smelled my Grandmother’s apple tree. As my friend saw glorious flowers and a beautiful river filled with gems, I sat on the old wooden tree swing and felt someone pushing me. Ah, could I dare to believe this was Jesus? So natural, so common, so familiar, so ordinary . . . so wonderful! What I was experiencing wasn’t at all like the things Charity had seen in her own walk, wasn’t like the things her friend who’d first shared the journey with her had seen on her own walk, wasn’t like the splendor my friend was seeing now. So simple. So free. Now Jesus and I sat in the grass on the edge of my Grandmother’s garden, and I smelled dill and rich, warm earth. “What does Jesus want to give you?” Charity asked. “That’s a good question!” I thought. Nothing was coming into my vision as my hands dug beside Jesus’ hands in Grandma’s deep brown, moist soil. Ha! My hand playfully put a smudge of black dirt on Jesus’ left cheek, and I sensed -or maybe dared to believe – it pleased him. This wasn’t the grand spiritual adventure, the overwhelming breaking in of the Holy Spirit that I had hoped to receive. This wasn’t Acts 2 in the upper room. This was sitting on the grass with my hands in dirt, my hands beside another set of hands, feeling completely at peace and joyfully loved. This was awfully ordinary for a powerful spiritual encounter. “Jesus wants to give you something. What is it? Ask him,” Charity gently encouraged. Vaguely I sensed something like a gold brooch in an extended hand, sensed rather than saw, and I got the impression the gold setting held an opal. He was holding it against my chest. “Ask him what it means,” Charity offered. Tears erupted from my eyes. My heart is under siege – has been for the past six years. This wasn’t the encounter I wanted with the splendor of God, but a sweet communion with the passionately loving heart of Jesus, and if he wanted to run under me on my Grandma’s swing and wear a smudge of dirt from my hand, that was more than fine by me. He was telling me there was no place he’d rather be than here in my heart. Opals are semiprecious stones treasured for their fire and light. Very fragile, opals deteriorate in heat and cold. They contain water, but lose water easily in dry air and become brittle, so opals need to be worn next to flesh so the oils from the body can seal in their moisture. 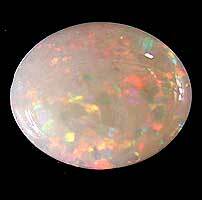 To clean an opal, you must wash it in pure water. Left to dry, an opal will crack and lose its brilliance and beauty. There it was, God’s word to me: my heart is like an opal, and just as fragile. He washed and cleansed my heart in pure water, the Living Water of Jesus. My heart is meant to be – God WANTS me to be – filled with Jesus, my heart pressed close to his so it doesn’t dry out and lose its fire, brilliance, and beauty. There is absolutely nothing common or ordinary in that truth! eternal life, the only one whose blood was costly enough to buy you back from the hand of Satan, but the road He has to lead you to himself may be more like the screen door out to green grass than ivory columns and marble floors. Don’t let anyone impose the counterfeit forms of religious obligation on you when what God wants to do with all the you you are and in all the you He created is conform YOU to a reflection of the likeness and love of Jesus. I clasped my opal pin on the chain of a necklace I haven’t worn in over 30 years. The pendant on the chain is a gold-colored, jagged-edged half circle inscribed with these words from Song of Songs 2:16: “I am my Beloved’s.” Surprisingly, when the opal pin hangs on the chain, it looks like a cross . . . .
A ” . . . BUT . . . ” to pray: Oh, Abba Father God, my heart feels crushed, ground into the dust, broken, BUT your word says, “All beautiful you are, my darling; there is no flaw in you.” (SOS 4:7) and you promise I can count on your love and power as “(I) wait in hope for the LORD; he is (my) help and (my) shield. In him (my) heart rejoices, for (I) trust in his holy name. May your unfailing love rest upon (me), O LORD, even as (I) put my hope in you.” (Psalm 33:20-22) Restore the lustre, beauty, fire, and water to my heart even in the driest place with the Living Water of your love, Jesus. Thank you that my heart is precious to you and you hold my heart close to yours! You created me with all of this in me ________________________________________________, the good and the flawed, the simple and the complex, the humble and the royal reflection of you in my talents to ________________________________________________________ and my desires to ________________________________________________________, my limitations of ________________________________________ that are the possibilities for you to ___________________________________________ out of your strengthened power to bless _______________________’s life and to bless the world by you doing ___________________________________________ in me and out of me anyway! Open the screen door for me,Jesus, to hear you say ____________________________________________________________________________ to me today. ” . . . BUT . . . ” Abba, Father, Beloved, my heart is weighed down with ________________________ BUT I know you desire to restore my heart, so I give you ______________________________________________ and I receive your _________________________________________________. Take me to that place where your heart resides in me. Amen!